A space for us all to come together in circle with council, storytelling, song, drum, dance and celebration on the esplanade. Join with us all as Indigenous Wisdom Keepers will Lead a Prayer Broadcast Live World Wide from Burning Man. Find a local event or register YOUR own event on the map at our website above! The drum is a heartbeat, it reminds us to listen, it shares many voices, many rhythms, and invites us to dance in celebration of this precious life. Indigenous Wisdom Keepers will be at the center of this prayer leading the drum circle and uniting the world into one heartbeat. The Tipi Circle sits under a Medicine Wheel, sometimes known as the Sacred Hoop. The Medicine Wheel Prophecy is present within many tribes from Northern United States, Southern Canada, and Inca tribes of South America, all together known as Turtle Island. There are many tribal perspectives on the Medicine Wheel: For many it represents the interdependence of all people, the four directions, the aspects of the cosmos, and of the individual. Also, embodied within the wheel are Father Sky, Mother Earth, and Spirit Tree. All of which symbolize dimensions of health, and the cycles of life. Medicine Wheels are traditionally made of stones arranged on the Earth. Found in various places throughout North America, they mark places of special significance, such as places of energy, ritual, ceremony, meeting, meditation, teaching, and celebration. The Medicine Wheel is the representation of all things connected within the circle of life and the unification of all tribes as we move into a new paradigm of love and compassion within the Rainbow Tribe. We see this pattern continuing when we look at the the four directions, the four elements of life, the four medicines, the four seasons, the four states of well being, the four colours of man and four stages of life. In the Hopi Medicine Wheel, prophecy represents the four peoples of the Earth. North is The cardinal direction represents the body, plants and animals, the color white and 'white skinned peoples', and Childhood. East is held to represent the mind, air, the color yellow and 'yellow skinned peoples', and Adolescence. South holds the heart, fire, the color red and 'red skinned peoples', and Adulthood. West holds the spirit, water, the color blue or black, and 'black-skinned peoples' and Elderhood. The West also represents the final life stage in the wheel, being an elder and passing on knowledge to the next generation so that the wheel may start again just like the circle it takes after. The Power of Prayer creates a space for the Standing Rock Spirit and movement to be present at Black Rock City. Red Lightning had the honor of having a presence at Standing Rock in the main camp, Oceti Sakowin (7 Council Fires), from October 2016 until the clearing in February 2017. We provided domes for community gatherings, solar and wind power, as well as support in the camp cleaning efforts. The space of the Tipi Circle is an invitation for wisdom keepers and tribal members from across Turtle island to join in the circle. The Project funding flows to tribal members as grants to support participation in the creation of the tipi’s and traditional seating. The funds flow to directly support cultural restoration and participation for native peoples who may or may not not join at the Burning Man event. Prayer: Join or offer the prayer, ritual, council, ceremonies, songs, dances, celebrations, etc. Share teachings: Share tribal prophecies, stories, and teachings into the medicine wheel circle as you feel called. Share story: Share the history of your people including struggles and victories dealing with colonization, attempted genocide, environmental destruction, and other challenges you face. Join: In the co-creation of the Power of Prayer Tipi Medicine Wheel Circle under the guidance of native wisdom keepers to develop the prayers, ceremonies, songs, and celebrations. Tipis: Send a Tipi to the circle. Send a traditional tipi sharing your tribe’s heritage and the story you would like to contribute to the medicine wheel prayer. The project provides funding for tipi's to be created traditionally and painted. Looking to the Grandmothers, Grandfathers, and the youth to share the heritage of the tribe and tribes future vision through the medicine wheel prophecy. The youth create the tipi under elder guidance. Experience Standing Rock in 360° & Virtual Reality as Digital Smoke Signals brings Indigenized Media to the Power of Prayer project. With never before seen footage shown in the 30' Dome from the top of Sacred Stone Camp through March 2017. The Dome is Donated from Pacific Domes & Digital Obscura to Standing Rock camps. We offer up a prayer of support. An invitation to join in the co-creation. Please come join us on the playa at Burning man and join us in prayer from the world over. A key intention is of Cultural Restoration. Help support tribal members coming to the playa and also those who contribute from afar. The tipis and rugs come from tribal members. The project's assets flow to tribal members through supporting the creation and restoration of traditional artifacts and practices. Support Wisdom Keepers: Support indigenous wisdom keepers, tribal members and youth with burning man tickets, camp fees, and transportation to and from the playa. Build Tipis: The tipis tell a story of each tribe. 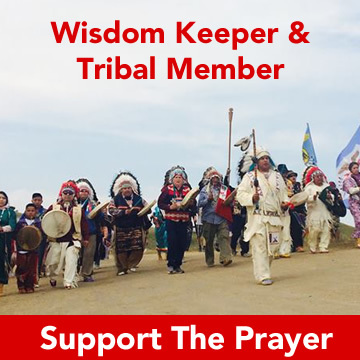 Power of Prayer provides funds for Tipis to be created in traditional ways by tribal youth with the guidance of the grandmothers and grandfathers. Promote traditional Rugs, Mats & Seating: Traditional rugs and mats will be the seating in the tipi circle. Offering another expression of tribal heritage that also contributes to the medicine wheel story and cultural experience. Project supports the traditional arts of rug and mat making. Medicine Wheel Shade Structure: This structure manifests the medicine wheel on the playa on a large scale. Provides shade for participants in the tipi circle, and promotes greater awareness of native culture. As a vital next step in our movement for a regenerative future, The Power of Prayer brings the Standing Rock spirit to Black Rock City at the front-lines of cultural and social change. Will you lend your support? Your tax-deductible donation to Red Lightning will directly cover costs of tipis, tickets, meals, and transportation to and from the Burning Man for devoted wisdom keepers, tribal members and youth. Donations may be sent to Red Lightning via Paypal, wire or check. Red Lightning is a non-profit project of fiscal sponsor Empowerment Works, Inc., a 501C3 charitable organization.